How do I filter promotions? In the "Promote Organizations" page of your dashboard you will find a tab called Filter Promoted Events. You can filter out events by three different criteria. Filter events by event type. Ex: exclude all fundraisers. Filter by location. Ex: exclude all events further than 100 miles outside of the radius of a particular zip code. Filter between virtual events and in-person. Ex: exclude all virtual events. Below you can see what it would look like if you wanted to exclude virtual events, fundraisers, and events that are more than 100 miles away from a zip code. An event that matches any one of those three criteria will be excluded. 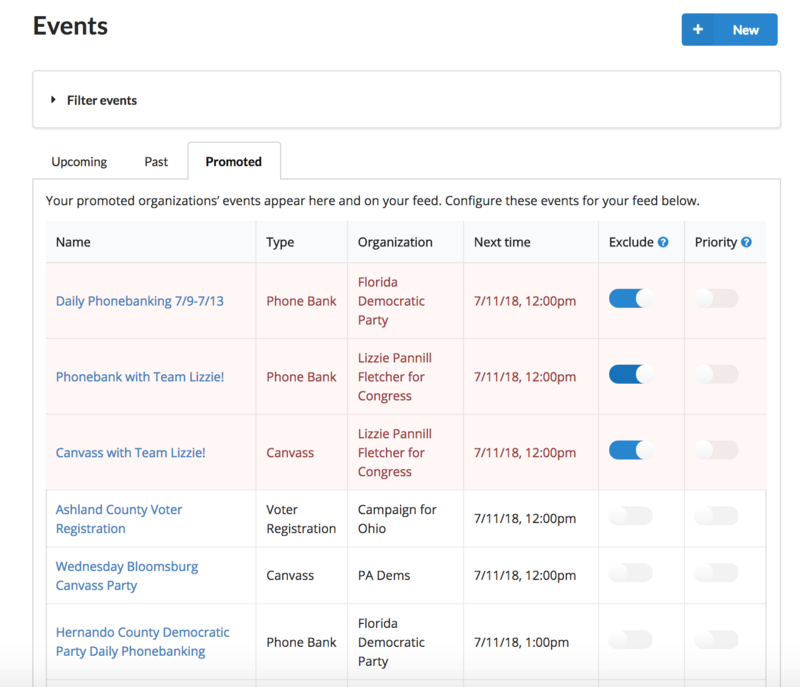 If you check the Promoted tab on your Events page in your dashboard, you will notice that all of the events that you have filtered out are highlighted in red and excluded. If there is an event that was filtered out that you want to re-include, you can manually un-exclude that specific event by toggling the Exclude button. Note that if you re-apply the filters, that event will be excluded and you will have to manually un-exclude it again.